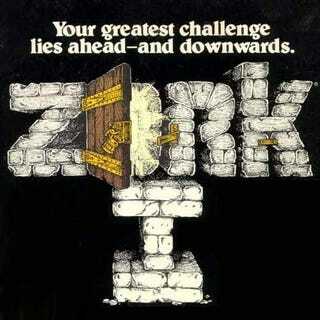 Errol and Pifie have written a walkthrough to help you beat the grand-daddy of text adventure games, Zork. You won't find it on Gamefaqs, however, because it's written as a rockin' three-minute song. It's called Walkthrough, and was penned as part of the 50/90 songwriting challenge, where entrants must write 50 songs in 90 days. "WAVE SCEPTRE", "LOOK", "GET GOLD AND COFFIN", "SW", "U" TO CANYON VIEW, "NW", "W", "ENTER HOUSE AND OPEN BAG"
"N", "W", "N", "W", "N", "E", "PUT THE TORCH IN BASKET", "LIGHT THE LAMP", "N", "D", "E", "NE", "SE", "SW", "D", "D" TO THE LADDER BOTTOM. "S", "GET COAL", "N", "U" TO LADDER TOP, "U", "N", "E", "S", "N", "U", "S", "PUT THE COAL AND SCREWDRIVER IN BASKET", "LOWER BASKET", "N", "D", "E", "NE", "SE", "SW", "D", "D", "W", "DROP ALL", "ENTER CRACK", "GET COAL, TORCH, AND SCREWDRIVER", "S", "OPEN LID", "PUT COAL INTO MACHINE", "CLOSE LID", "TURN SWITCH WITH SCREWDRIVER", "OPEN LID", "GET DIAMOND", "DROP SCREWDRIVER", "N", "PUT THE TORCH AND DIAMOND IN THE BASKET", "E", "E"
BACK TO THE LIVING ROOM, "LIGHT LAMP", "D", "N" "W", "S", "U", "TAKE COINS AND KEY", "SW", "E", "S", "SE" TO THE CYCLOPS ROOM. "KILL THE THIEF WITH KNIFE"
"PUT ALL EXCEPT THE LAMP INTO THE CASE"